Brings back clarity, radiance and smoothness back to the skin. 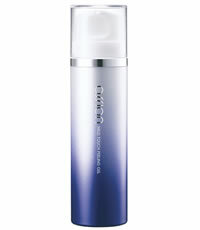 Non-irritating peeling gel that is gentle and refreshing with visible exfoliating results. Mild Touch Peeling Gel is of much similarity to ‘dry coconut flakes’, unlike ‘hard lump’ scrubs which have possibility to enlarge pores and roughen skin as time goes. It contains Merdel Complex that not only sooth but also hydrate and nourish the skin effectively by removing dead skin cells & controlling melanin pigmentation. Merdel Complex contains of Deep Sea Water and 11 Deep Sea Minerals to purify, hydrate and firm skin as well as ability to immediate sooth skin irritations (e.g. redness, itchiness…). Unexpected skin allergies will occur even in the 30-40s, as such it is important to purify, maintain & improve skin protection against these internal or external stresses. Skin turn-over cycle slows down as we age or even basing on our diet habit, if we do not remove the dead skin cells, new and healthier skin cells are unable to surface and this results in dull looking skin as well as uneven skin tone. Acne: 1 time, minimize massage strength. Combination: 2 times, concentrating more on T and U-zone area. Sensitive (Sensitized): 1 time, minimize massage strength and sensitive areas. After cleansing and drying, evenly apply an adequate amount to face avoiding the eye and mouth areas. In a circular upwards motion, massage into skin then rinse off with water (preferably warm water). Take caution to avoid getting product in eyes. Following with OSSION Mild Touch Soothing Overnight Pack or usual skin care routine especially Toner (Fluid). Minimize strength of massage on sensitive areas (e.g. open pimple wounds). This entry was posted in Uncategorized and tagged Fr3b Singapore’s 1st Sampling Concept Store, Fr3b.com, free beauty samples, Free giveaways, free samples, freebies, OSSION MILD TOUCH PEELING GEL, S’pores 1st Sampling Concept Store, singapore free beauty samples, singapore’s 1st online sampling platform More stats. Bookmark the permalink. do you have any agent at Jakarta – Indonesia, so i can buy ossion at Jakarta?? and how about the price? ?